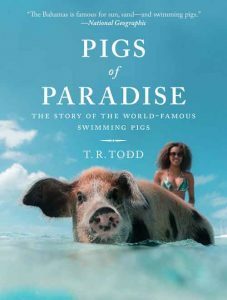 In the middle of paradise, with billionaires and celebrities for neighbors, there is an island populated only by Swimming Pigs. There was a time when these animals were largely unknown to the world. And suddenly, they went viral. Appearing in magazines, videos, newspapers, commercials, TV shows and countless selfies, the Swimming Pigs of Exuma became a bucket list sensation. But how did they get there? What made them so famous? And why, in February 2017, did so many of them die? ’Pigs of Paradise’ is an unlikely story of humble beginnings and the swift rise to stardom. With interviews from historians, world-renowned ecologists, scholars, famous pig owners and boat captains, it thoughtfully considers not only what this phenomenon says about these animals, but also about ourselves. A portion of every sale is donated to the Bahamas Humane Society. Follow along on Facebook, Twitter & Instagram! Ask us a question and we'll get back to you! "EXUMA, BAHAMAS - HOME OF THE ORIGINAL SWIMMING PIGS!"